Like a lot of folks in Western North Carolina, Tom originally hails from Florida where it feels like it's too hot to breathe outdoors most days of the year and the air conditioning runs indoors 24/7/365. It only took one summertime trip to the mountains of North Carolina to convince Tom that he needed to make a move. After purchasing a small vacation cabin in Stecoah Valley in 2007 and spending every minute they could there, Tom, his wife Susie and their two daughters bought an 1880's farm house on 15 acres just up the road in the Summer of 2015 and moved there permanently. 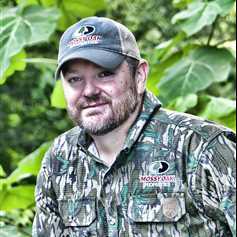 Pursuing and now living the dream of owning such an idyllic little homestead is what has motivated Tom to work with Mossy Oak Properties. While growing up in rural, Central Florida, Tom gained a deep appreciation of the outdoors by dove hunting with his dad in his family's orange groves in Alturus, duck hunting on Little Crooked Lake, gator hunting on Lake Okeechobee and bass fishing the legendary phosphate pits of Ft. Meade, Florida. Nowadays, when Tom isn't helping people find their favorite place in the mountains, you can find him tending to the garden or hanging out on the pontoon boat on Lake Santeetlah putting off trying to go home.